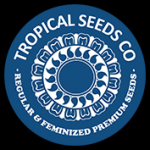 Tropical Seeds - Red Afro Feminised Seeds. Free US delivery. Red Afro is a cross between an African Swazi plant with a Pakistan Chitral Kush. The rationale for this was the quest for a Swazi-based strain that had an altogether shorter, more compact, structure and faster flowering time. The result is a great success; Red Afro produces large, dense colas with dazzling red and purple colours at maturity and which delivers very good yields both indoors and outdoors in somewhere between 65 - 75 days flowering. The deliciously enticing aromas include red fruits with floral notes and a Kush, hash-like background taste. Its effect is immediately uplifting which slowly evolves into a more relaxing experience.